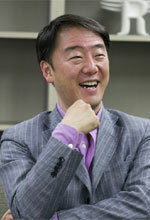 Chief Executive Officer, ENTERPRISE Huge Co., Ltd.
Born in 1963. Mr. Shinkawa joined Hasegawa Enterprises, Ltd (Now: Global Dining Inc.) in 1984, and became a board member in 1988. 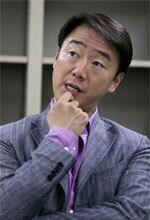 In 2005, Mr. Shinkawa left the Global Dining and founded ENTERPRISE Huge Co., Ltd. Currently, Huge is operating Ginza Dazzle and Café RIGOLETTO Kichijoji, and many other restaurants in Japan. Nakasa: I think we should begin our conversation with TABLEAUX in Daikanyama. That's where our friendship began. Shinkawa: Right, that's when I was working for the Global Dining Inc. Right before taking the TABLEAUX's position as a manager, I was a manager of ZEST Restaurant (Mexican cuisine restaurant, operated by the Global Dining) in Mishuku (located near Shibuya). As you may know, Mr. Nakamichi, who is a partner of your company, was in charge of the photo shoot of ZEST Mishuku so obviously, I've heard about you before TABLEAUX. But I have to admit that it was 1992, when TABLEAUX opened and you became one of our guests, began calling me Hiro -- just like my close friends who visited the restaurant frequently. 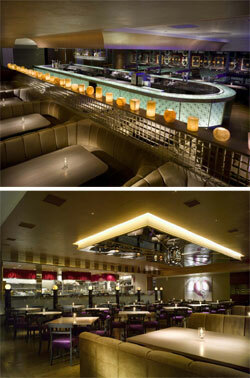 I think TABLEAUX had created a new era -- new wave to the Global Dining, myself, and the entire dining industry. Well, let's look at it from my perspective. I used to be a manager of a Mexican restaurant, ZEST, and all the sudden, this same guy is now in charge of a Los Angeles style restaurant. Even Mr. Hasegawa, the CEO of the Global Dining, was a little nervous on his move. "Can Hiro be fully responsible and handle this new restaurant?" There's more to it. It was just too hyper, and edgy. The interior design and even the style of the restaurant are something that has never existed before in Japan. Because of these factors, when the restaurant began its operation we couldn't attract as many guests as we anticipated. If you look at its interior design, the name of the restaurant, TABLEAUX (meaning painting in French), defined its design -- the wall is fully covered with paintings. If you look at the food we serve, it was neither French nor Italian. We just said,"Yes, we are an edgy restaurant." But I was certain that if we can sustain for at least a year, this place is going to be successful. You may be curious to see where has this confidence come from... Well, it's not only because we had created an unprecedented place, but also frequent guests' great attachment and love to the restaurant. Some of them visited us at least once a week, and they brought friends. Next time, these friends brought another friends... The wave of connections through the guest's word of mouth assured me the success of this "edgy-ness." Nakasa: The most memorable thing that happened at TABLEAUX was that when Pierce Brosnan, who is the latest James Bond character on the 007 series, came over. When he was seated, you naturally served, "Bond Martini" as if the order was placed by him beforehand. I was really impressed with your spontaneity and consideration on your service, and I just couldn't stop giving applause! Do you think these actions are one of the sources of TABLEAUX's success? Shinkawa: Before we began TABLEAUX, we had a trip to the U.S. for a few months to conduct a market research. The American-style dining was a really dynamic way of eating and had a number of large portion dishes and share. But if it would be difficult to adopt the style for Japanese people because we usuall have a number of small portion dishes. Plus, an idea of sharing was non-existent back then. But still, soon or later, I was quite confident that this U.S. style dining culture would spread around in Japan. So the task was to how I can bring the U.S. style, and adopt it into the Japanese market. And of course, the smartness of serving Bond Martini should not be neglected! The solution to this task was to divide a large portion dish to a small portion. For instance, pasta. Its one portion is usually for 3-4 persons, and we made it in away that the guests could order it by a number of guests. The idea of "diving into a small portion" - it may sound easy, but it will put so much burden to the kitchen. If you think about it, a hall and kitchen can be described as water and fire. A waiter, who is bringing demand from the guests constantly, is creating new tasks to the kitchen. So, I strived to fuse these two elements and lift up their motivations. Even a cook, who is mincing a cabbage on the very back of kitchen can feel the warmth of guests, and able to say "Welcome to TABLEAUX!" from their heart. That's the spirit we needed to create. In that sense, everyone has put their effort into this, and that's how TABLEAUX became so successful. And the other thing is that frequent customers attracted many new customers by their word of mouth. Back then, there were no dining information website and magazine like Time Out, so the word of mouth was crucial. It took a whole year to spread but after that, a wave of reservation phone calls did not stop. When I reminisce that moment, it really bring back this thrilling moment. Nakasa: Speaking of a thrilling moment, I visited RIGOLETTO BAR AND GRILL in Roppongi with my staff the other day for the first time. When I called to make a reservation, the operator reponded, "Thank you for calling, Mr. Nakasa." ..I have visited DAZZLE in Ginza many times, but I've never been to RIGOLETTO BAR AND GRILL! Don't you think that's thrilling as well? Does this response mean that all the customer information is shared within the HUGE operated restaurants? Shinkawa: Yes, we are the HUGE family! To me, I think "recognition" is something that has to be valued more. For instance, when you call a department store or restaurant, most of the time, its first response is, "Thank you for calling. This is restaurant XXXX." I think this manual-ized answer is so out of date. When creating DAZZLE I considered this factor very carefully, and as a result, we have created an online customer profiling system. When I receive a call from you the system identifies your phone number and cross match with our customer database, so we know who is calling and his preference when it comes to dining at our place. When I said my colleague that I am going to introduce the same system at RIGOLETTO, everyone opposed. "It does make sense to introduce such a system at DAZZLE, where everyone spends lots of money. But if you do the same at a place where it serves 300 yen tapas, that's going to be an over-investment." But I went on anyway, and as its consequence, you were thrilled, right?! I think one of the reasons why I am good at creating thriving restaurants and attracting many customers is that I am simply doing just above what customers expect. A place like RIGOLETTO, you wouldn't expect a waiter to move a chair when seated. And you wouldn't expect waiters to remember your name when visited for the second time. But from these actions, you would think, "This is a restaurant that costs only 3000 yen per head but yet, look at the service they offer!" The customers will surely be astonished, and as its result, the success. But speaking of RIGOLETTO, we cannot do this every time. If you have called at 4 pm to make a reservation, I am not really sure if we could do the same, because during this time, the staff is busy preparing for the night. But it's RIGOLETTO - where they serve 300 yen tapas - in terms of the service, customers know how much to expect, and such behavior is within their capacity. So all we do is to strive without breaking our limitation. It sounds cliché but this is something that I value. Nakasa: RIGOLETTO started of from Kichijoji, then Ginza, Marunouchi, Sendai ... and now, the latest installment is in Roppongi Hills, one of the hip complexes in Tokyo. What is up with this location? Shinkawa: Roppongi, where the competition of a dining industry is fierce, an operation of 550 square meters restaurant is quite a challenge. But I do have a strong confidence to achieve success. 9,000 people are working at Mori (Office) Tower and 70,000 people visit Roppongi everyday. This figure is excluding the in-and-out traffic from subways. When you look at this number, or inhabitant, this is equivalent to a small township. Considering this population, I thought if we can create a restaurant that can be used once a week for many purposes, it's going to be a big hit. One can order a pint of beer, worth 500 yen and spend 2 hours talking, as if he is at a bar. One can order aglio e olio pepperoncino, worth 600 yen as if he is at a café. Each customer's spending may be not that high, but people will build up an attachment to the restaurant. As its consequence, someday, those frequent guests may have a party here, or bring parents over for dinner. Don't you think it's exciting and interesting that one restaurant is providing several style of dining occasions? Nakasa: I have to admit that when you talk, you are so energetic and filled with fun! Shinkawa: If you are working for this industry it is really important to be filled with joy and excitement. Some people look at listing to a stock exchange as an ultimate goal, but I am not that kind. Since I was trained from a waiter when I stepped my foot in this industry, my main concern is nothing but service. Service itself is more of a right-brain-derived, actively-created, and instinctive deed. So much needlessness motions and thoughts have to be put in. For instance, when a customer asks for a glass of water, I can serve it right away and story could end there. But you have to think, "He might have one more cup of coffee instead today, so I should hold on to serving a glass of water." These forward thinking may end up as a total waste, but if you work for this industry, you have to regard this as fun. Those people who know how to deal with service are not working for money, it's more of an instinctive fun. I need to gather these kind of person and sometimes, it's tough to find them. But it's so thrilling to see them grow. Even in the near future, I am curious to think about how much thrilling events I can accumulate --- even by thinking about it, don’t you think that's already thrilling?